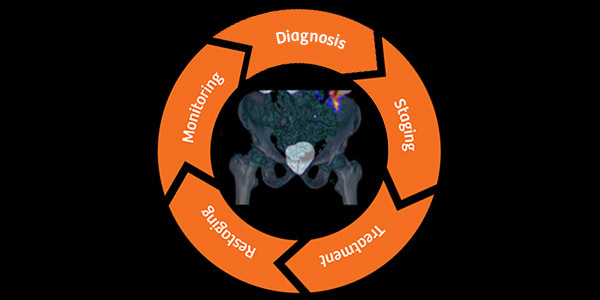 Molecular imaging plays an important role in the evaluation of prostate cancer and visualizes the extent of disease and biological response to treatment throughout the continuum of care. Although the present application of new tracers in molecular imaging is used to help determine recurrence, evaluation of primary disease and theranostics are emerging topics of investigation. Learn more about our comprehensive solutions in prostate cancer. Stay up-to-date with the Siemens Healthineers Newsletter. Sign up today for the latest news, education, and offers. 2 Torre, LA., et al. Global cancer statistics, 2012, CA Cancer J Clin. 2015 Mar;65(2):87-108. doi: 10.3322/caac.21262. Image data courtesy Praxis für Fusionierte Bildgebung, Halle (Saale), Germany. • Unsubscribe from the Molecular Imaging Insider.